Maritzburg United coach Ernst Middendorp was pleased to see Mohammed Anas come off the bench to score, and will be hoping that Anas and Evans Rusike continue to find themselves amongst the goals. While captain Kurt Lentjies has been the Team of Choice’s top scorer with eight goals this season, Rusike has climbed to five goals, four of those coming in 2016, while Anas scored the important second goal in United’s 2-0 win over Golden Arrows on Friday night after having been out the team for a while. “It was not only the [half-time] talk, but also bringing in a third striker in [Mohammed] Anas, who had disappeared a little over the last weeks, but I always had my eye on him; to use the words from some of the commentators, he’s guy who is in the kitchen, and he is definitely who paid back, doing the job of scoring the second goal, which was very crucial for us,” said Middendorp of the Ghana-born Anas. The Team of Choice head coach also said he has been working well with Rusike, ensuring the 25-year-old Zimbabwean is given the encouragement and backing he needs to get his confidence levels up. “I saw him in training for two or three days [upon the German’s arrival at the club]. For me it was very clear that he was a man that has to be given the entire confidence, and support. He was here for a long time, and he didn’t probably didn’t received the certain support. “It’s always about assessing and identifying what’s possible. Its normal, its nothing, I hear other coaches are getting angry. But I see stuff different. If I see Evans being available in this position, and getting the support, I think he’s giving it all, and shows what type of striker he is – one of the most qualified in the league, there is no doubt about that,” said Middendorp. 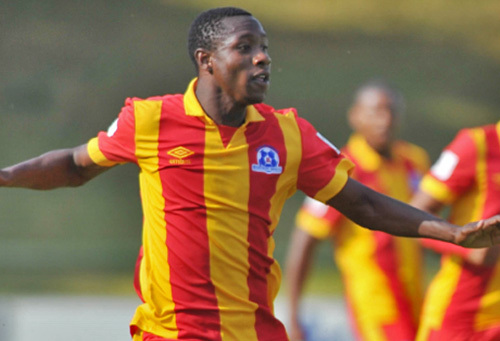 United are next in action on Sunday afternoon, when they take on Chippa United in Port Elizabeth.